In 1502 Leonardo da Vinci made a simple drawing of a graceful bridge with a single span of 720-feet. Da Vinci designed the bridge as part of a civil engineering project for Sultan Bajazet II of Constantinople (Istanbul.) The bridge was to span the Golden Horn, an inlet at the mouth of the Bosphorus River in what today is Turkey. But, the bridge was never built. Leonardo's "Golden Horn" Bridge is a perfect "pressed-bow." Leonardo surmised correctly that the classic keystone arch could be stretched narrow and substantially widened without losing integrity by using a flared foothold, or pier, and the terrain to anchor each end of the span. It was conceived 300 years prior to its engineering principals being generally accepted. It was to be 72 feet-wide (24 meters), 1080-foot total length (360 meters) and 120 feet (40 meters) above the sea level at the highest point of the span. 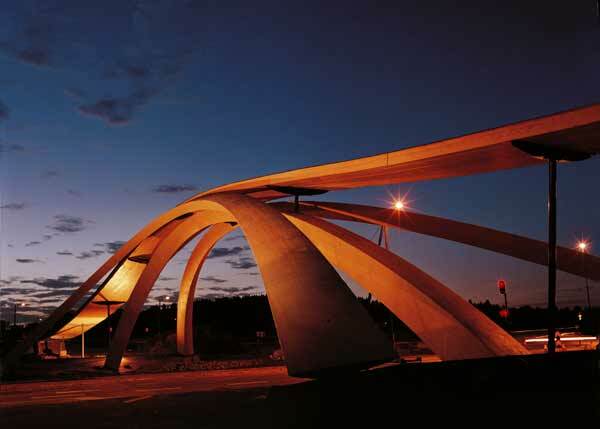 Norwegian painter and public art creator, Vebjørn Sand, saw the drawing and a model of the bridge in an exhibition on da Vinci's architectural & engineering designs in 1996. The power of the simple design overwhelmed him. He conceived of a project to bring its eternal beauty to life. The Norwegian Leonardo Bridge Project makes history as the first of Leonardo's civil engineering designs to be constructed for public use. Vebjørn Sand took the project to the Norwegian Public Roads Administration. Though hardly a visionary organization, when Sand presented the project the reaction was unanimous. "Everyone on the project knew we would be making something more than another boring bridge," Sand says of his meetings with government officials, "We would be making history." The artist and architect worlds combined Tuesday to ask the question: What would Leonardo da Vinci do if he were to build a bridge in West Texas? That question came after officials with the University of Texas of the Permian Basin announced that UTPB will be the only North American site of a bridge designed by Leonardo da Vinci, nearly 500 years ago. Best known for his painting “Mona Lisa,” Italian artist da Vinci was also a scientist. In 1502 he designed plans for a bridge to be built in modern-day Istanbul, Turkey, but because of its complex nature the bridge never came about. Norwegian artist Vebjørn Sand has made it his personal crusade to share da Vinci’s designs with the world. So on Tuesday, Sand along with Dan Hart, an architect with Odessa’s Parkhill, Smith and Cooper, premiered their vision. The two will determine how best to design a pedestrian bridge for West Texas, but still keep the unique da Vinci design. “As an artist I have the responsibility to keep the beauty and dignity, grace and design as I first saw it,” Sand said. Sand collaborated with the Norwegian Transportation Ministry to build the first Leonardo Bridge in Oslo, Norway in 2001. His goal is now to have one constructed on each continent. Sand enlisted the help of Melinda Iverson, international projects liaison with Brickfish Creative Services, to embark on this quest. Odessa is the first North American community to really commit to the project. On Tuesday both Sand and Hart said they wonder how da Vinci would react to all the building materials now available. A bridge at UTPB might combine steel with the natural limestone unique to Texas. Hart said there are two possible sites for the bridge, each one bearing different costs. One site would be over the south entrance to the campus. The bridge would have an 8 0-foot span over the entrance with a total span of 200 feet. The cost would be about $1.5 million, Hart said. The second site would be over the arroyo, or a ditch area, near the fire station on the southeast end of the campus, he said. The bridge span over the ditch area would be 40 feet, while the total span would be 100 feet. The costs of this bridge would be about $400,000. The only jump UTPB has on funding this project is the $40,000 grant from the Texas Parks and Wildlife. UTPB submitted a grant proposal for improvements to the three-mile trail around the campus. The bridge will be part of those improvements. The university is on the hunt for more funding. Kay Bivens with the Institutional Advancement Office will be accepting any donations for the project. Rick Dempsey, assistant vice president for UTPB physical plant, said once officials decide where to build the bridge it would take about six months to a year to finish the project. The site could be determined by this summer. To help steer the project, UTPB has developed Team da Vinci with representatives from the Odessa art community, UTPB and architects Parkhill, Cooper and Smith. Crystal Barrios, a junior UTPB math major, attended the press event because she said she was unsure of the idea for the bridge. Barrios said like any other student she is concerned with how the university spends money, but she is hopeful that the community will chip in on the cost.